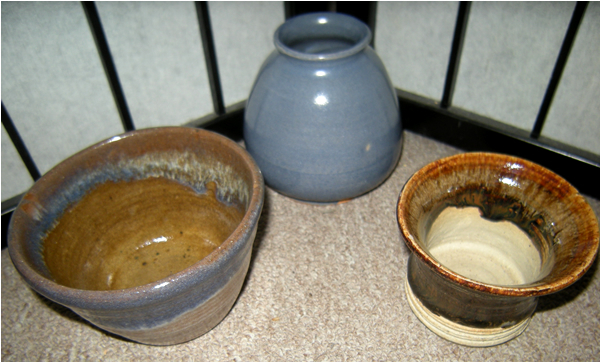 I am new to collecting studio pottery, so, as of this posting I am unfamiliar with the various types of clay and glazes, therefore do not know much about these 3 studio pottery pieces I've acquired yesterday and today. I collect Asian art & antiques of various forms, mostly Chinese and Japanese porcelain, so I am frequently visiting antiques shops, thrift stores, and several other second hand merchandise types of stores looking for new pieces for my collection, but it wasn't until very recently that I became interested in collecting studio pottery, and so yesterday while out on one of my usual treasure hunts, I found this tan and blue glazed studio pottery bowl signed Graf, at least that's what I think it says. It is also marked R-S, but I have no idea what it means. Later on in the afternoon, I eagerly began searching for information about who made this and from what decade or year it may have been made, but as of yet, I have learned nothing about the artisan who created this piece. 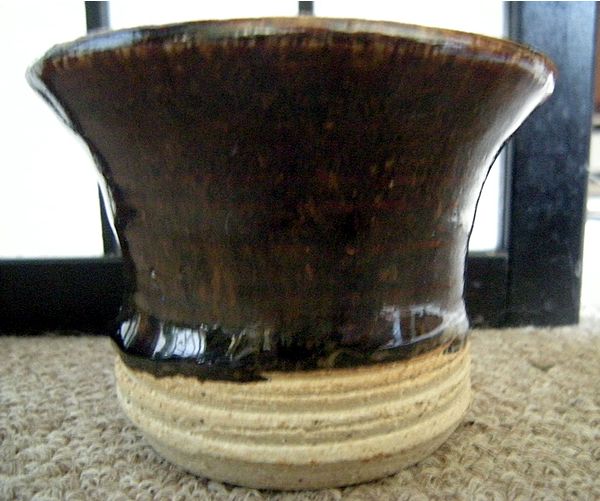 I joined the Facebook group "Studio Pottery Collectors" and made my first post, asking for information on the piece, but thus far, no information has been obtained. 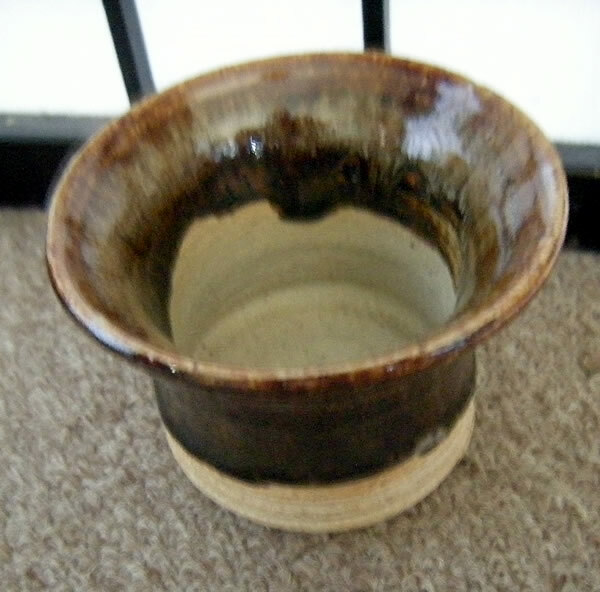 As I continued to look around hoping to find answers I ended up learning a little more about studio pottery, and even came across many auction listings for various different kinds of studio pottery, some of them very expensive, and apparently very collectable. Although I at this time have no interest in selling, the idea of a piece having high monetary value is appealing to me, because one never knows when a financial emergency may arise, and perhaps it could be an extra investment, or even more importantly, it can contribute to a better estate for my daughter when my time on this earth has come up. 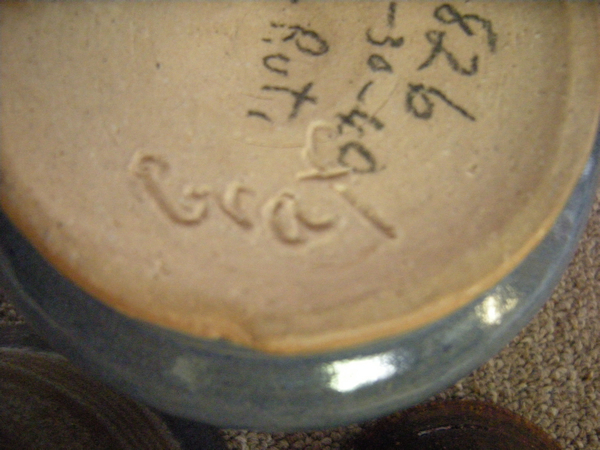 As a result of seeing the various prices of several forms of studio pottery, I returned to the shop where I purchased the bowl, because I recalled seeing several pieces, all with the same signature, Graf, and all with R-S. Unfortunately, I could not afford the few higher priced ones, nor was I willing to pay the asking price, however, I did purchase two additional pieces for $2 each, so now have three pieces of studio pottery signed Graf. 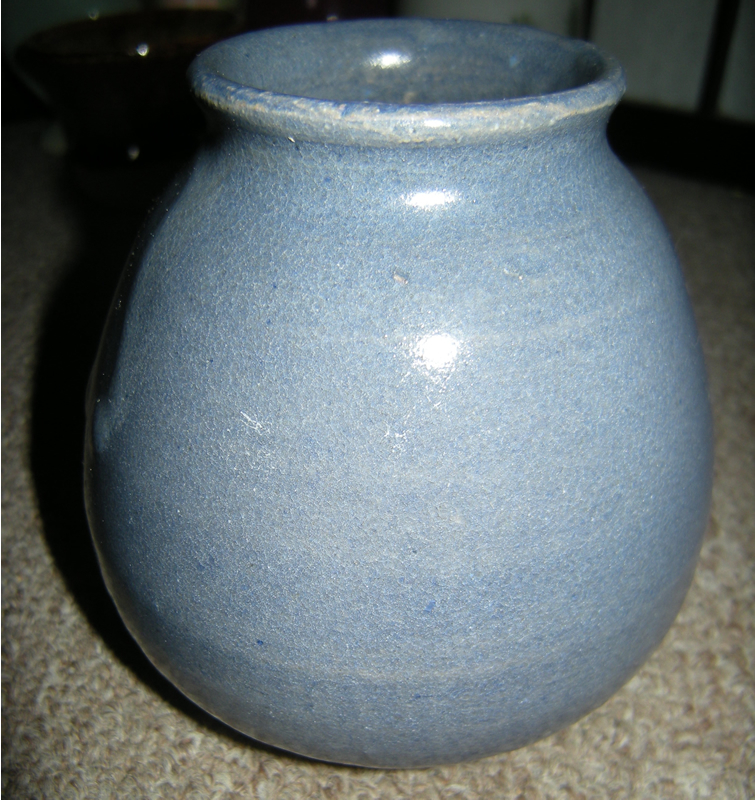 In addition to the aforementioned tan & blue glazed bowl, there is a blue glaze jar, and what I can only describe as some form of cup, although the bottom portion of the interior is rough and crude, making it unsuitable for functional beverage use. 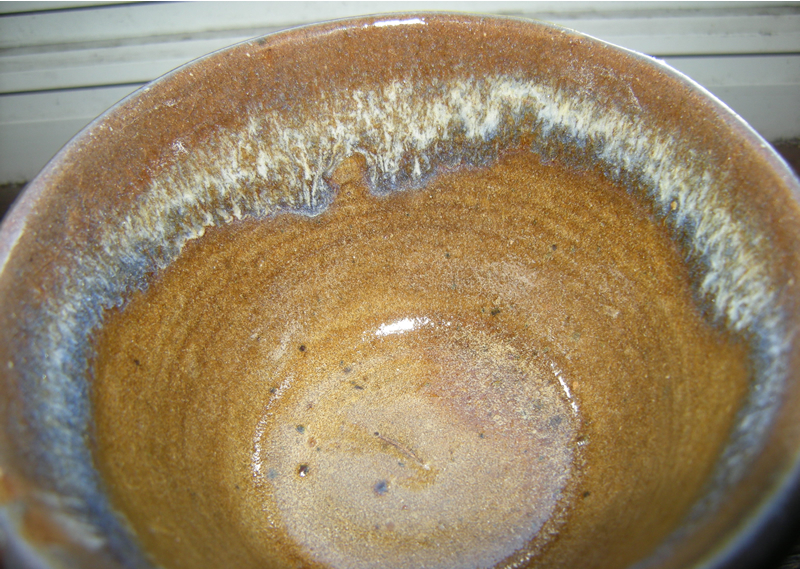 It has a brown glaze, and the clay feels rough, like coarse sand. All of them are signed Graf, and all are marked R-S. 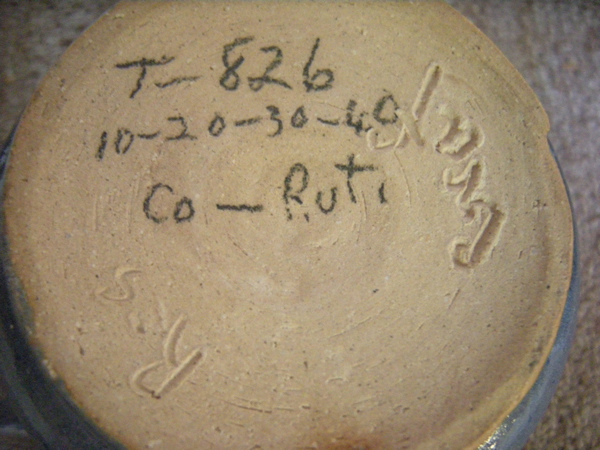 The blue jar however, has some writing on it that says "T-826, 10-20-30-40, Co-Ruti" , but I have no idea what it means. 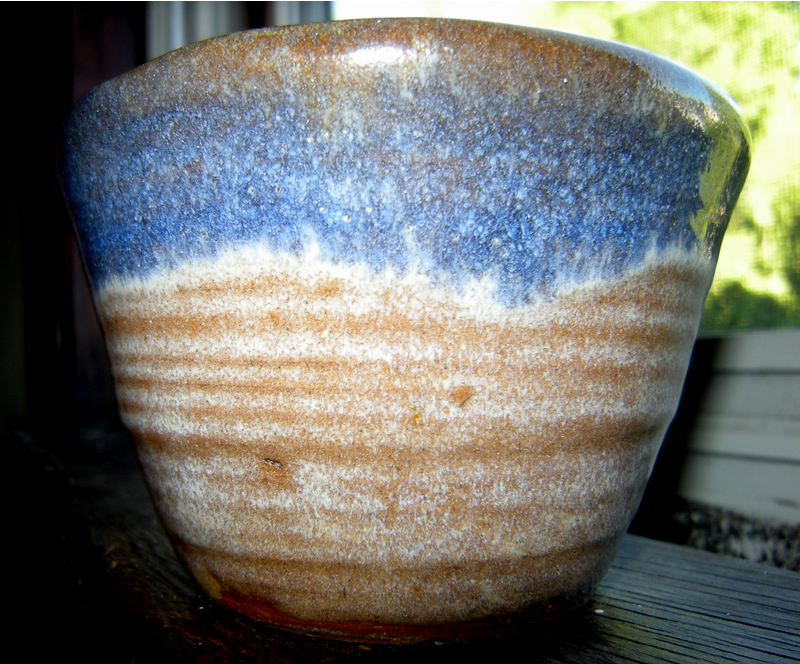 Tan and blue glazed studio pottery bowl, signed Graf. 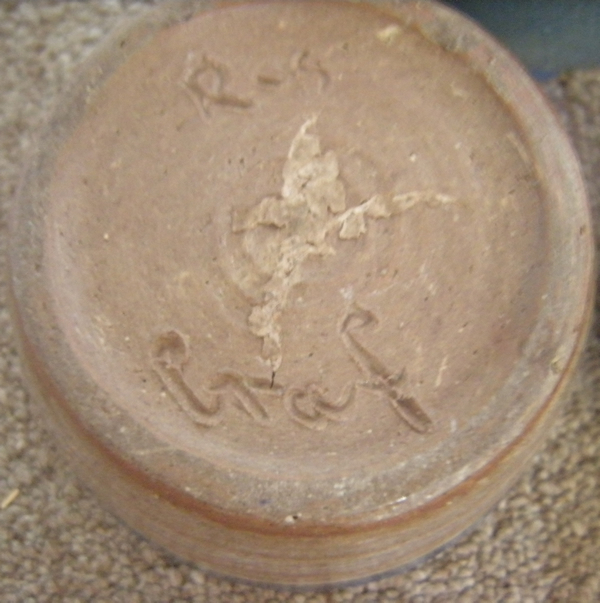 Blue glazed studio pottery jar, signed Graf. 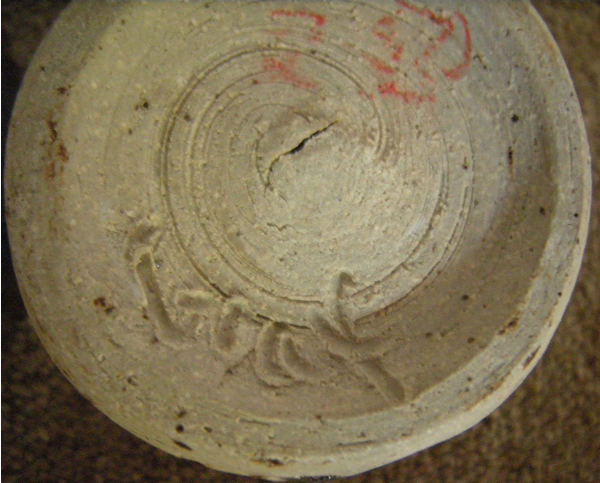 If anyone reading this knows anything about who the artist is of this studio pottery, please leave a comment. 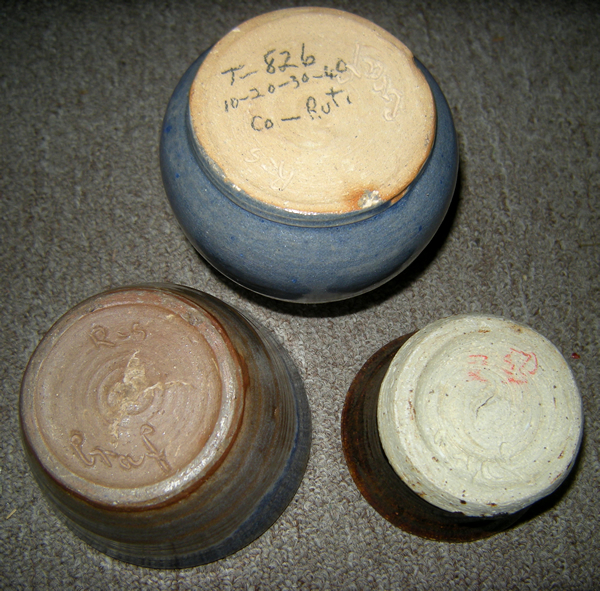 Additionally, as I am a new collector, and wish to learn more, I'd appreciate it if anyone could tell me what types of glaze and clays these pieces are made of, etc. Thank you. Did you ever get an answer? I have a large bowl with this mark.